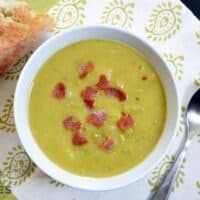 This unique soup combines the best of split pea and potato soups with some crispy bacon for extra flavor. After 45 minutes of simmering, test the peas to make sure they are very soft. Turn the heat off and let the soup cool slightly. Remove the bay leaf and then use an immersion blender to lightly blend the soup until it is creamy with a few chunks. If you don't have an immersion blender, carefully transfer a few cups at a time to a blender, drape a towel over the lid, and pulse the contents until smooth. Work in batches until half of the soup is blended smooth. Taste the soup and add additional salt as needed (I added about 1/2 teaspoon). Serve with crusty bread or garnishes like shredded cheddar cheese or sliced green onions. *I use Better than Bouillon brand soup base to make my chicken broth. It's less expensive than canned or boxed broths.